Free Nights Offer – Stay 7 nights pay for 6, stay 10 nights pay for 8, stay 14 nights pay for 11. Please contact us for further details. Maldives Taj Exotica Resort and Spa ranks as one of the most prestigious addresses in the Maldivian archipelago. Brimming with 5 star amenities, swathed by understated opulence and out-of-this-world natural splendour, this is one of the most stunning properties in the elite Taj collection. Quite literally breathtaking, this resorts packs in plenty of wow factor with its jaw-dropping location situated on a narrow island encircled by one of the largest natural aquamarine lagoons in the world. With three fine dining establishments, two bars, a well-staffed deluxe spa and a variety of activities such as reef snorkelling and yoga, guests can enjoy a varied holiday with the upmost service and care from the attentive staff. There is also a dedicated personalised butler service for all the palm-thatched villas to offer a helping hand with luggage, arranging excursions and special requests. The Indian Ocean resort sets a precedence for lavishness and authentic indigenous influence balanced against warm hospitality from the friendly local people employed in the resort, for whom nothing is too much trouble. Early Booking Offer – Book at least 90 days in advance to save up to 15% on your stay. Free Nights Offer – Stay 7 nights pay for 6, stay 10 nights pay for 8, stay 14 nights pay for 11. Honeymoon Offer – Complimentary honeymoon treats available when staying for your honeymoon. Specialising in Indian rejuvenation therapies, the in house spa’s alluring menu ranges from Indian aromatherapy massages and beauty treatments to yoga and meditation. There is plenty to keep you entertained including snorkeling, diving, water skiing, windsurfing, parasailing, fishing, sea kayaking, island hopping, shark and sting ray feeding and banana boat rides. A luxurious honeymoon should be about ultimate spoiling to celebrate a once in a lifetime occasion, market-leading Taj brand hotels are devoted to giving the world’s most discerning travelers truly unforgettable experiences in some of the most exotic and relaxing locales of the world. Start your honeymoon with a thrilling speedboat ride to ‘Three Coconut Island’ and enter a world of magically seamless comfort. Arrive at your well-appointed villa with private plunge pool and personal sundeck and marvel in panoramic vistas of the Indian Ocean. Wine and dine your partner with a romantic candlelit dinner on the shorefront, or with a gourmet picnic on a deserted island. The Maldives resort is defined by privacy and intimacy, in keeping with Taj philosophy and service design, making it an idyllic retreat for newlywed couples. Foodies will excite at the eclectic culinary experiences on offer, whilst those in need of TLC will revel in the impeccable service given at the in-house authentic Indian Spa sanctuary. Most definitely one of the most striking natural habitats in the world, with pale white fine sands and crystal clear waters abundant with marine life, you quite literally cannot believe your eyes when you go to the Maldives. 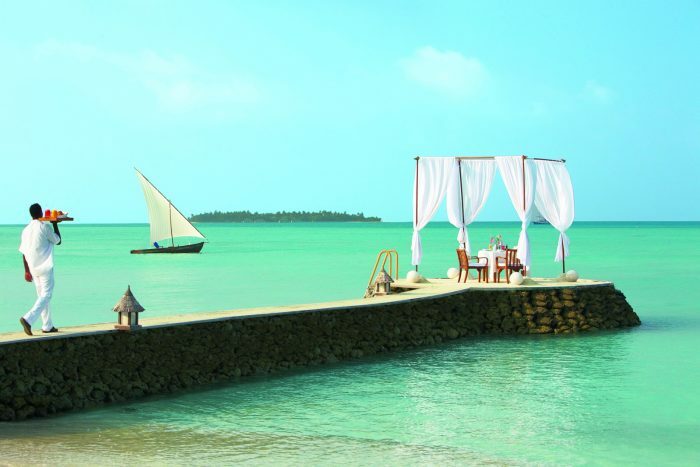 Make your honeymoon by far the holiday of a lifetime and choose the Maldives Taj Exotica Resort and Spa. Choose from three fine dining restaurants and two bars serving the very best in European, local and international fare. 24 Degrees – Serving all day the open kitchen restaurant serves Pan-Asian and European comfort food. Expect nightly themed dinners showcasing food from around the planet. The Deep End – An upscale modern restaurant offering the best of Mediterranean and contemporary Western cuisine and gourmet trends. The Equator Bar – Perfectly balancing atmosphere and music, The Equator Bar features an extensive drinks menu, cigars and shisha alfresco on the beach patio. 24-hour In-Villa Dining – Enjoy a midnight feast or breakfast in bed with 24-hour room service. The Pool Bar & Restaurant – Order oven-fresh pizzas, cocktails and tropical juices next to the infinity pool.